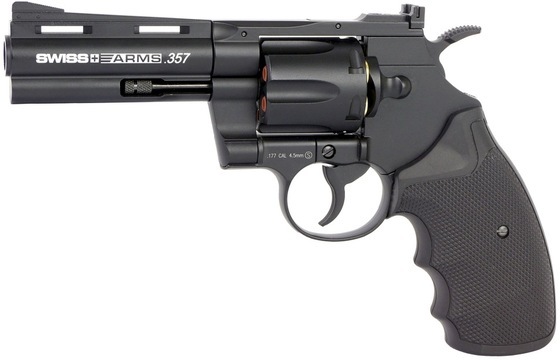 We have just added the Swiss Arms 4 inch & 6 inch Full Metal Revolvers to the US Store, these are basically teh KWC made guns licensed through Cybergun with the Swiss Arms licensing so you can check out my Umarex Colt Python 357 since it too is the same base gun made by KWC. 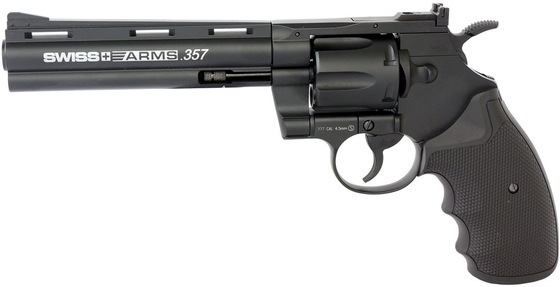 Here are the specs for these Shell loading 357 styled CO2 4.5mm BB Revolvers. 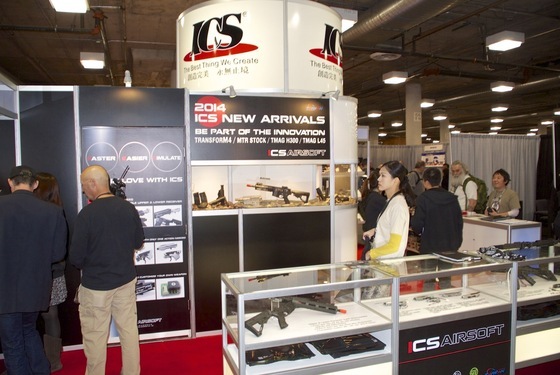 I stopped by the ICS Booth, we don't sell too much of their products but have carried a few items from time to time. 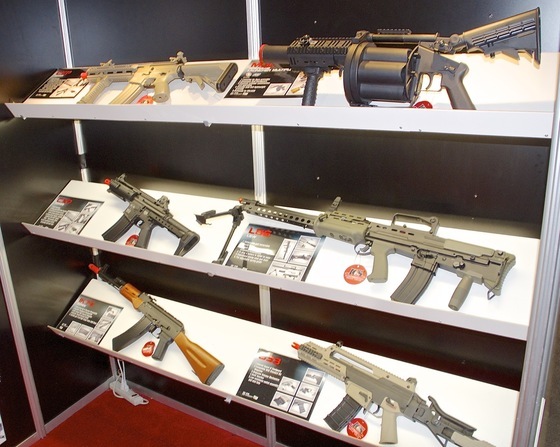 ICS caries some nice quality Airsoft guns including the M1 Grand with real wood stock, and some AK & AR variants. 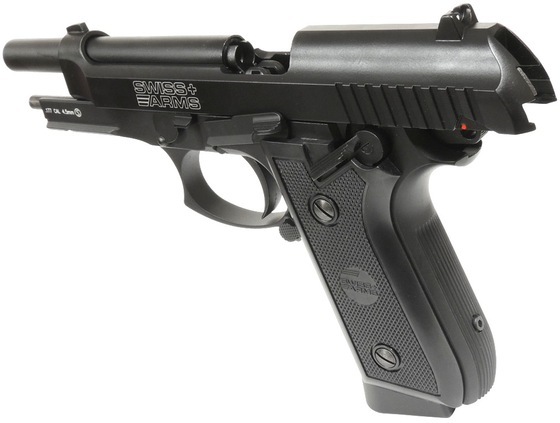 One of our suppliers had the new FN Herstal Five-seveN Blowback Airsoft pistol, I believe made by Marushin. 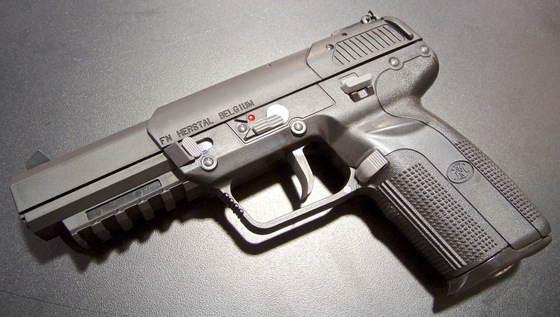 Like the real FN Herstal Five-seveN, the pistol is pretty much all polymer including the slide and frame. 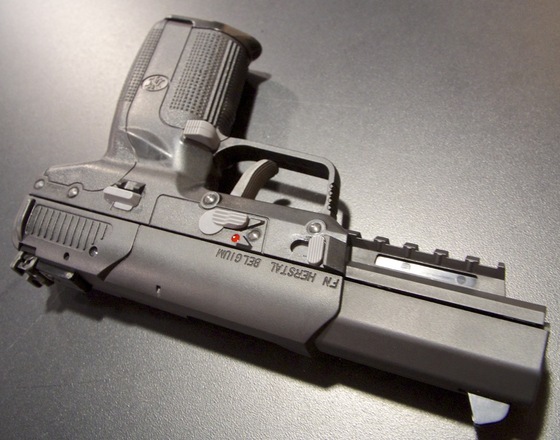 This pistol also uses CO2 in the full size drop out magazine which should make it fairly powerful. 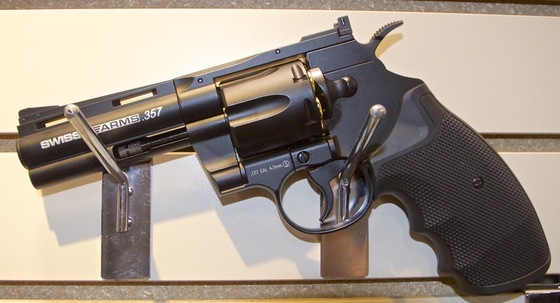 Looks like there is another Dan Wesson contender available now in the form of a Swiss Arms S&W 357 Magnum 4 inch and 6 inch barreled version, they look really nice and like the Dan Wesson have the realistic reusable brass shells that hold the 4.5mm Steel BB's. 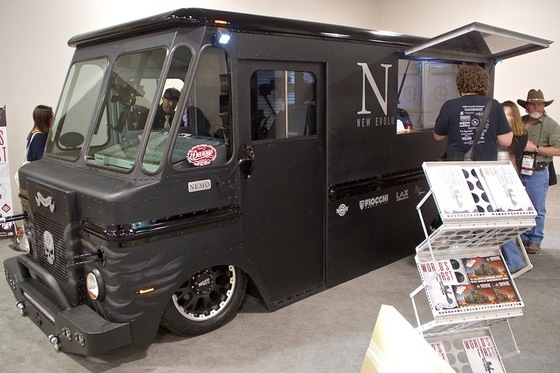 Ever considered owning a mobile Gunsmith vehicle, look no further, I came across this pimped out Firearms Van complete with machine guns mounted in the front :) Inside was a complete firearms workshop. 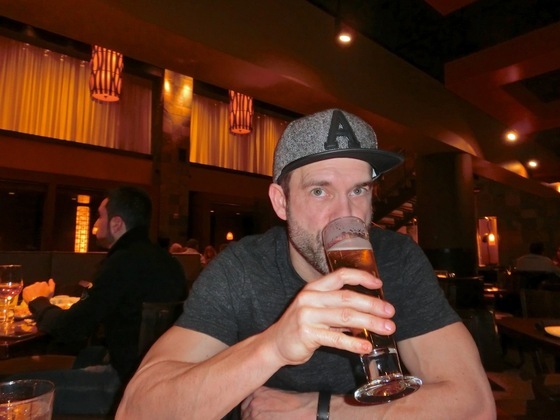 Last but not least, we had some fun while in Vegas. I go down for the SHOT Show for business but I also bring my wife and we make time for some non business related activities. 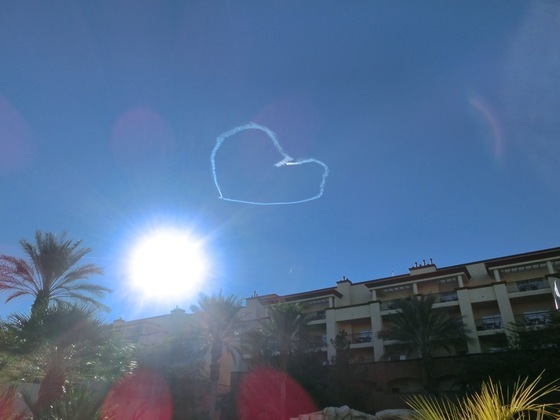 I generally stay at the WorldMark resort each time and this year the weather was pretty nice so we where able to get some sun by the pool a couple of days and I even got a tan line! 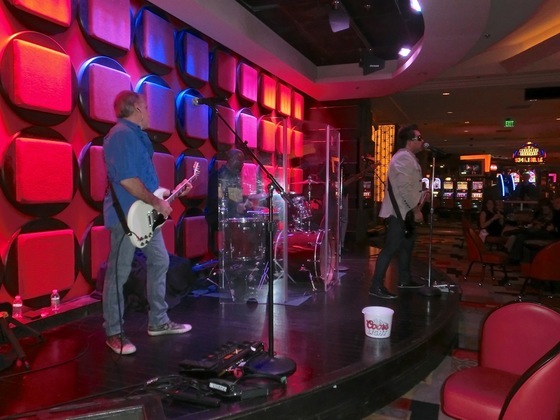 Of course the food and entertainment is always awesome in Vegas. 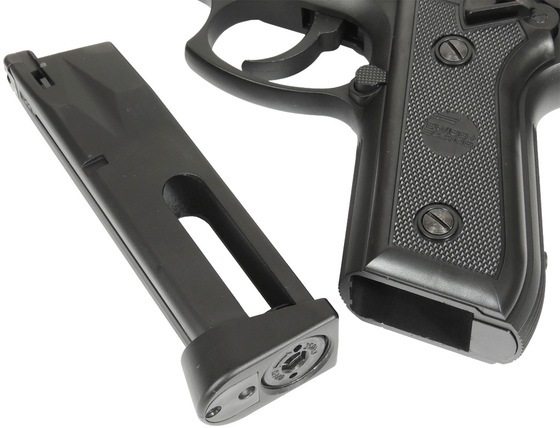 We have been out of the Cybergun Tanfoglio Witness and KWC 1911 styled Blowback BB pistols for w while now and have them on preorder (Still waiting), the good new is we just got in some Cybergun Swiss Arms branded versions which are exactly the same but with teh Swiss Arms licensing on the slide. 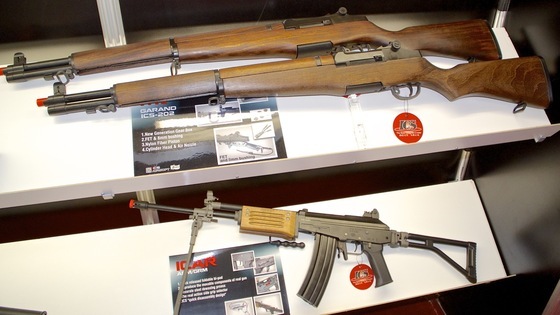 Same gun same price so grab one while we still have them. 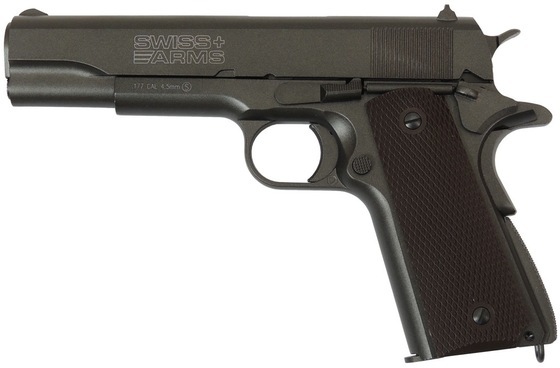 We have the Cybergun Swiss Arms 1911 Blowback 4.5mm BB pistols in both our Canada and US stores. 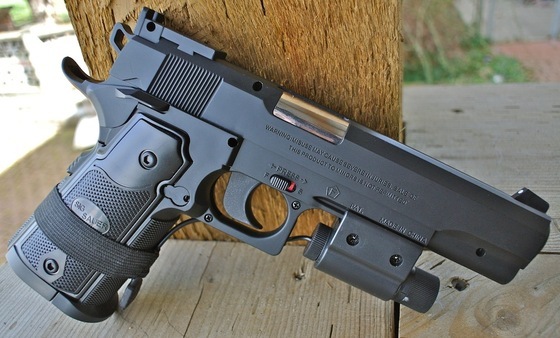 Model: Sig Sauer GSR 1911. Materials: Mostly plastic construction with a few metal parts. Action: Semi auto, double action. FPS: 398 claimed - 450 real world. 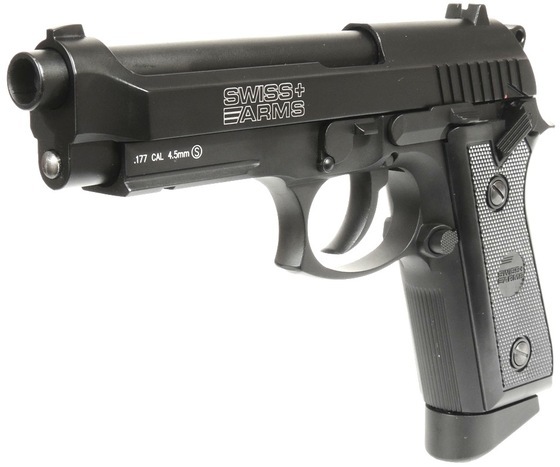 Trigger Pull: The Swiss Arms Sig Sauer GSR 1911 has a double action trigger with about a medium weight pull to it. 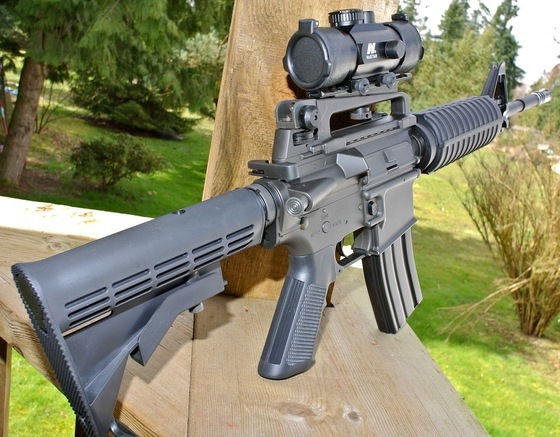 It does feel somewhat long as the break point seems to take a while to get to but once you master where it is, you can shoot this BB gun with surprising accuracy. Accuracy: Once I sorted out the laser sight which took some MacGyvering (as explained in the video), this gun shot a nice tight pattern! For my quick test I shot free standing from 20 feet away and put 8 rounds into my target taking my time. I got about a 1.5 inch group which was very good and another note worth mentioning would be the Chronograph results I got, even though the Sig Sauer GSR 1911 CO2 BB pistol has a claimed fps of 398, mine came in consistently right around 450 fps! Realism: The Swiss Arms Sig Sauer GSR 1911 in terms of size and looks, is about what the real gun would look like, with the exception of the trigger which is kind of a strange looking combination of triggers mashed into one. 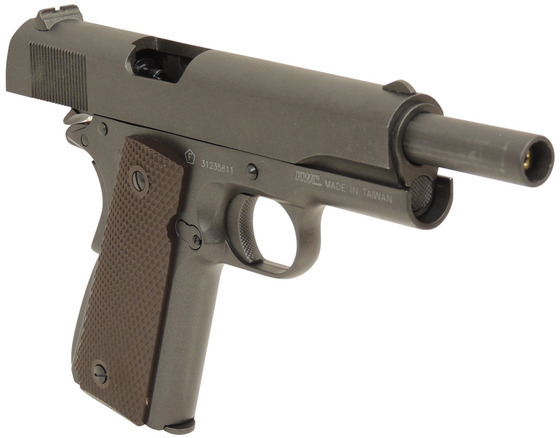 Of course being a moulded plastic airgun, it is much lighter then the real steel 1911 and has the telltale screw holes on the right hand side. 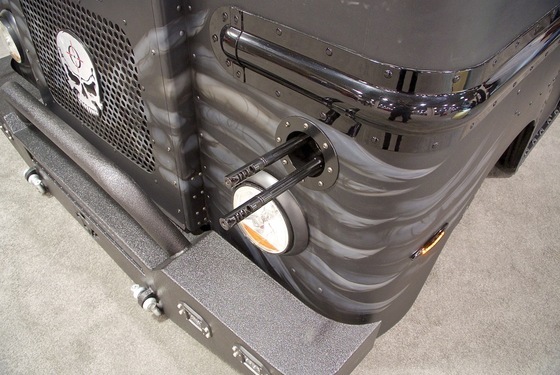 The magazine ejector does work but the real steel safety, slide catch/release, hammer and grip safety are all moulded into the plastic so they do not function. On a good note the barrel muzzle is large like a real 45 caliber adding to the realism. 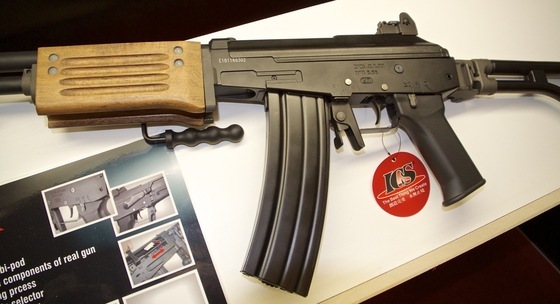 Purchased this gun from: The Replica Airguns Store. Much better than advertised FPS and good CO2 usage. (up to 200 shots). 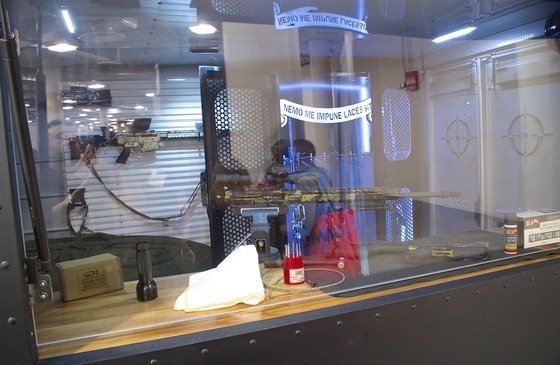 Good accuracy once you get the laser working with the gun it adds to the ease of targeting. Well hidden CO2 tab and 45 caliber sized muzzle. light weight makes it feel a bit on the cheap side. Trigger action is long and takes some getting used to. Laser sight needs to be MacGyvered a bit to make it stay sighted in (again watch my video on how to fix this). 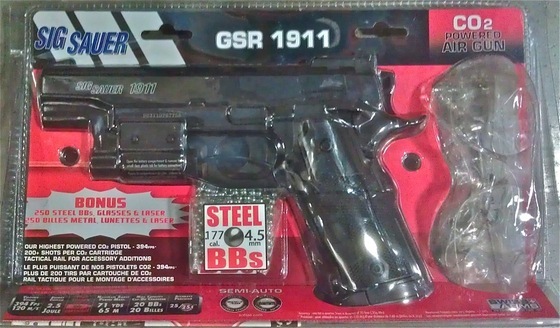 The Swiss Arms Sig Sauer GSR 1911 is pretty much what you would expect from a low cost airgun in terms of build quality, lots of plastic, with less working parts. 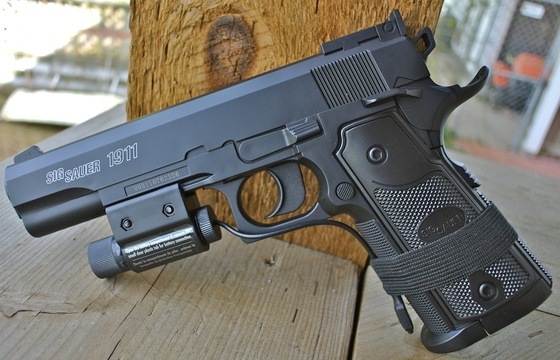 This does not take away from the performance however as the GSR 1911 performed well in both accuracy and power. 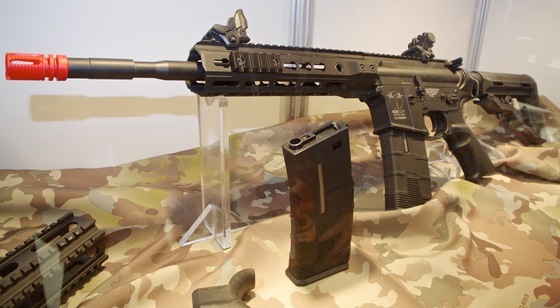 It also comes with the laser sight, safety glasses and starter BB's as an added bonus for about the same price as many entry level airguns on their own. 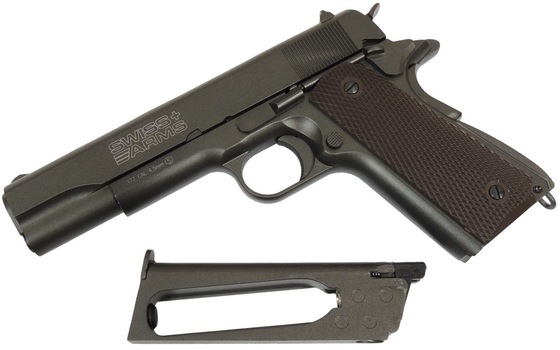 If you like ultra realistic guns then this is on may not be for you, but if you want a good performer with the replica look and combined with a value package then I think you will be more than happy with the Swiss Arms Sig Sauer GSR 1911. 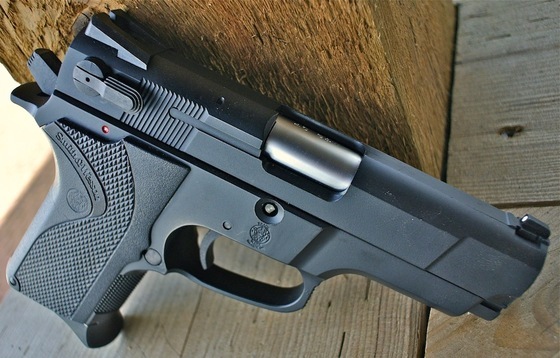 The verdict is not out yet for the Swiss Arms Sig Sauer GSR 1911 4.5mm BB Pistol. I really had no idea what this airgun was like and so I was eagerly awaiting for it to show up so I could get a closeer look at it. 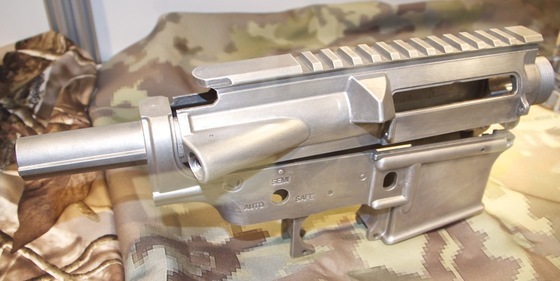 For a $79 gun you do get a lot: 400 fps, with a 20 round drop out metal magazine, included laser sight with pressure switch, small pack of 4.5mm zinc plated BB's and a pair of protective shooting glasses. 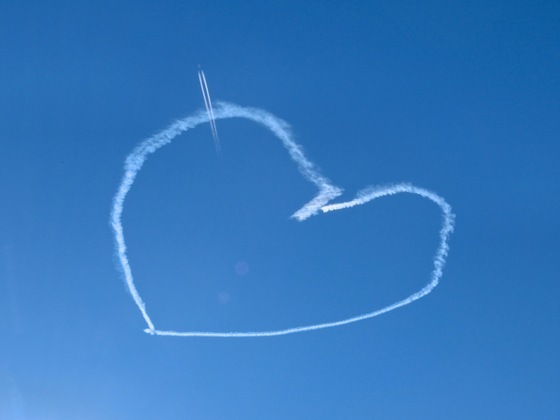 All in all a good value! 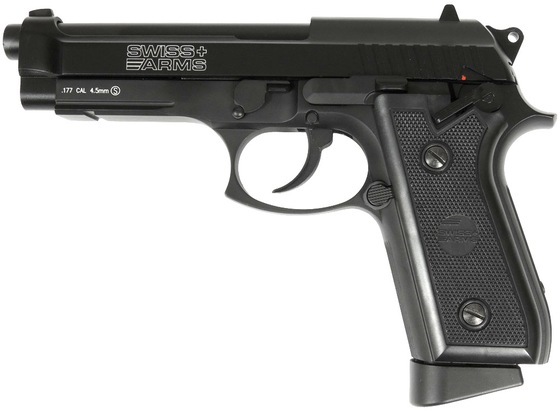 I have a new air pistol for my Canadian customers arriving in about a week! 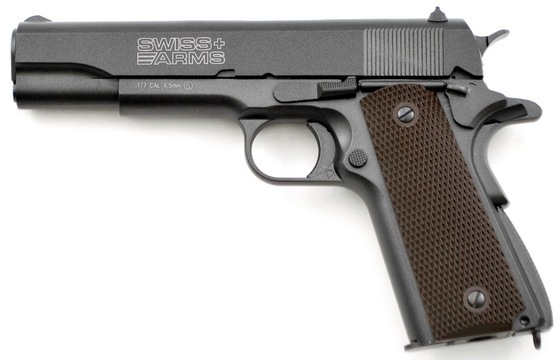 Sorry I have limited info on this Swiss Arms Sig Sauer GSR 1911, I will updating the info here as soon as I know more about it?